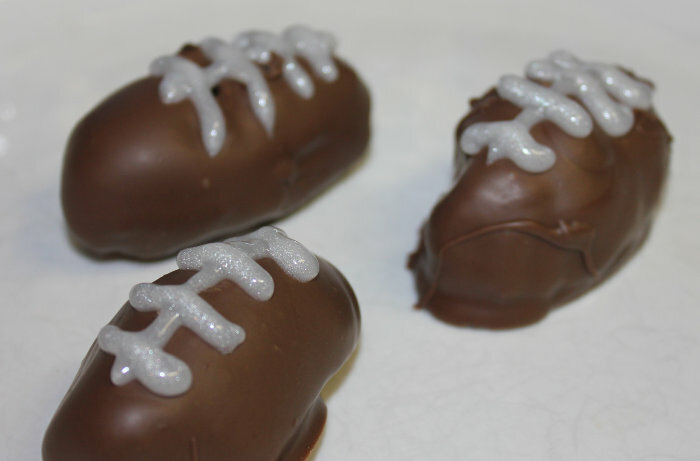 OREO Cookie Balls Football Recipe for the Big Game! It's time for "The Big Game" and that means more awesome treat ideas to make your football party awesome! No big sporting event is complete without controversy and boy oh boy have we had that over the past week with some guys in New England. Unfortunately, it shows no sign of ending between now and the time you are going to be holding your "super" awesome football party next week. So let's capitalize on it by making a treat that will make your guests laugh, giggle, and maybe even start a spirited discussion or two! With that said, here is our recipe for Tom's "Deflated" OREO cookie Footballs. This is a ridiculously simple recipe that any guy can do and only takes about 30 min to complete (not counting time in the fridge to harden the chocolate). First though, we need to head out to Walmart to get supplies. OREO cookies can be found in the cookie aisle of the grocery section. The days of the simple black and white cookie are over, so for this recipe I picked the OREO Mega Stuf and Peanut Butter varieties, but I encourage you to experiment with other flavors if you want, including Birthday Cake, Cool Mint, or Golden. I made a couple optional modifications to the official recipe and used 2 12oz bags of milk chocolate chips and white icing for the laces. 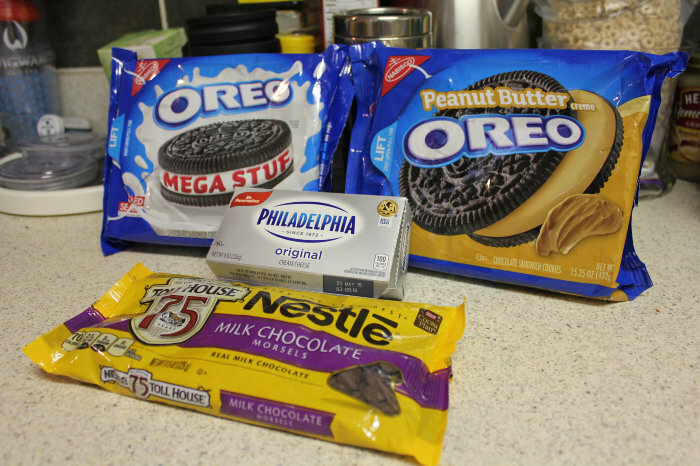 I also encourage you to buy an extra package of your favorite variety of OREO cookies since they are simply awesome to snack on while you whip up the recipe! That's it! Seriously, I told you this was going to be easy. 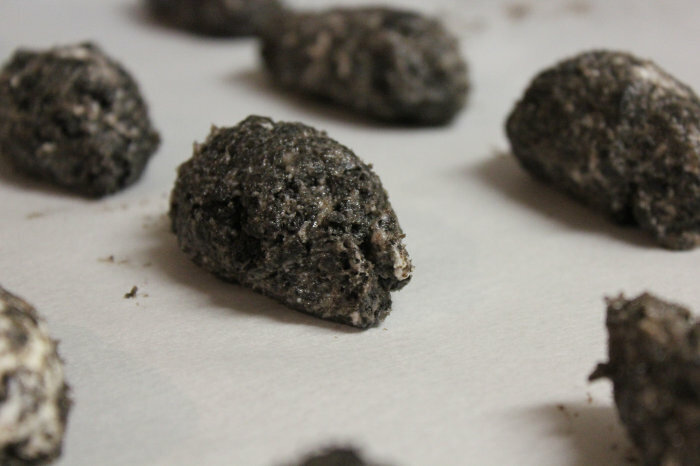 Take the OREO cookies and put them in a freezer bag and wail away on them with a meat mallet till the cookies are reduced to crumbs and there are no large chunks left. 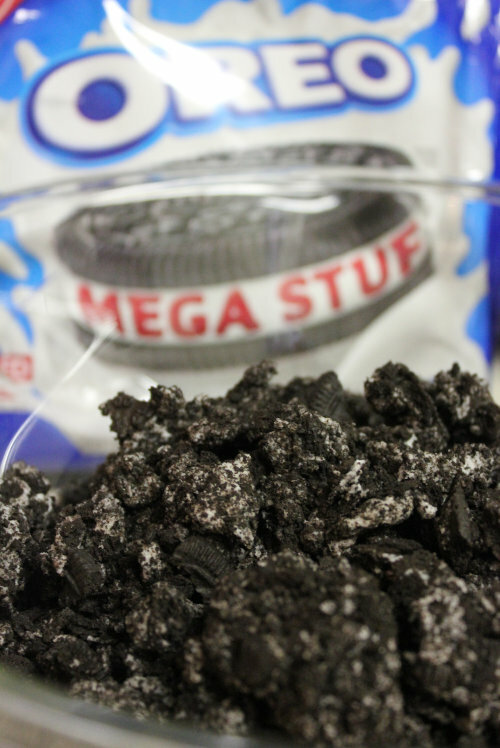 Drop the crushed OREO cookies in a mixing bowl and add the (softened) cream cheese, then mix them together. After you have mixed the cream cheese and cookie pieces together, take the mixture and roll it into mini footballs about 1-2 inches long. You can use your hands or take two spoons to shape them. Make sure to remember though - these are not regulation footballs and Tom likes them a little deflated so it's ok to have the edges not quite "regulation". Once you have them all rolled out, place them on a wax paper covered cookie tray, stick a toothpick in each one and stick them in the freezer to firm up. Melt the chocolate in a double boiler so that you don't burn the chocolate. Once fully melted, using the toothpick, take the cookie balls out of the freezer and dip them in the chocolate and make sure they are fully enrobed. After you have dipped each football, remove the toothpicks and place the cookies in the refrigerator to solidify the chocolate covering. After about an hour (or when your chocolate is hard), remove the pan from your freezer, it's time to add the laces! While a regulation football has 8 rows of laces, we are going to keep things simple, so as the finishing step we'll take that tube of white icing (in this case I chose white glitter icing because I think it looks cool!) and add one long row of icing with 4 cross hatches for the laces. So there you have it - Tom's "Deflated" OREO Cookie Footballs recipe and if the reaction to this in my house is any indication then these are going to be a HUGE HIT at your party too. Plus, since it is so easy to make it's easy to do two different varieties like I did using Mega Stuf for one batch and Peanut Butter for the other.